One of the simplest ways to update your bathroom to give it a new lease of life is by updating your bathroom taps. Our Architeckt basin and bath mixer set allows you to create a cohesive and stylish finish with ease. As the perfect pairing for a contemporary or modern bathroom, our Architeckt set will add instant style and a high quality finish. In a beautiful sleek chrome, the Architeckt Malmo Bath Mixer Tap is striking in design and super efficient. Spend more time relaxing in the bath and less time filling it – this tap allows you to fill your bath quickly at the perfect temperature and enjoy a long and relaxing soak. Made from solid brass and finished with multiple layers of chrome, the finish is dazzling with a high shine, while the quality ensures the tap is durable and made to last. 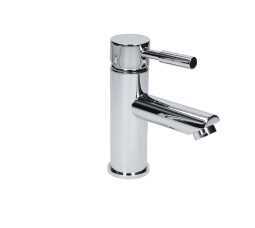 The high quality chrome ensures that the tap stays rust free, for a long lasting and striking shine. With quarter turn technology, the taps are easy to use and always smooth. In addition, the modern washers will not wear out or need to be replaced. In a beautiful matching design, the Architeckt Malmo Basin Tap Mixer is stylish as well as practical and functional. Made from solid brass and finished with beautiful high quality chrome, the tap is made to last, while the striking chrome finish keeps its shine and will not rust. Using quarter turn ceramic disc technology, the tap has been precision engineered for ultra smooth use. Perfect for use with all types of plumbing systems, you can be sure this tap will work perfectly with your sink and will look stylish and sleek. The single tap design is perfect for contemporary bathrooms, allowing you to run the perfect temperature of water instantly through one tap. Whether you are completely renovating your bathroom, or you just want to add some stylish updated, the Architeckt basin and bath mixer set is the perfect way to add a contemporary and quality finish.